For decades, scientists have been intrigued by a black hummingbird that appears to be singing, its throat and jaw moving in all earnestness, but without making any obvious sound. Augusto Ruschi, a naturalist who catalogued dozens of hummingbirds in Brazil’s Atlantic Forest, first noticed it in 1959. It would be years before that special equipment was available, and it happened to come from the lab of Christine Portfors, a professor of biological sciences at Washington State University Vancouver. Portfors usually studies bats, who navigate their world by processing the echoes of sounds too high for us to hear. But soon after she came to WSU Vancouver in 2001, she met Claudio Mello, a behavioral neuroscientist at the Oregon Health & Science University. 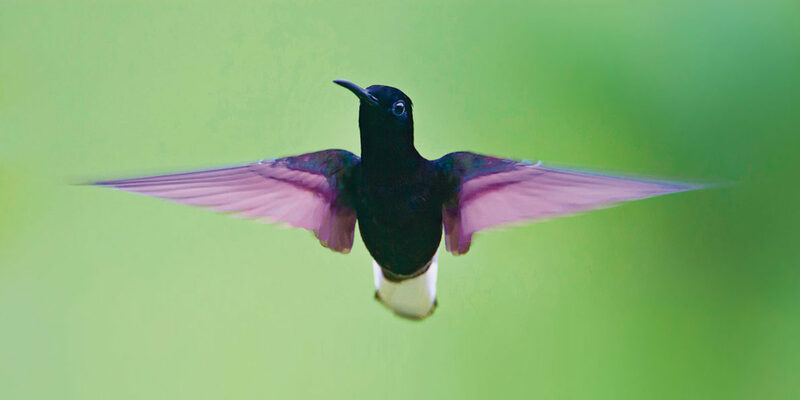 A student of vocal learning in birds, as well as a Brazilian, he too had noticed the black Jacobin’s singing behavior and an odd, high-pitched part of its song. Together, Portfors and Mello lit on a little noticed, seen-but-unheard feature of the natural world. The two visited Brazil and made some recordings in 2005, and Mello later returned to make hundreds more recordings with Portfors’ equipment. Back in the United States, their labs made digital versions of the recordings and visualized them to analyze the songs’ characteristics. They were surprised to not only confirm that the vocalizations were ultrasonic but that they were well above the range of hearing documented in nearly 50 bird species. Humans hear between 20 hertz and 20 kilohertz, with the higher frequency falling off with age. A barn owl, which Mello calls “a hearing specialist,” can hear eight or nine kilohertz. The Jacobin’s vocalization starts at 10 kilohertz, with higher harmonics reaching 80 kilohertz, well outside the range of human hearing, as well as avian hearing. Or so we have thought. It’s possible, but unlikely, that the birds are hitting these frequencies by some sort of accident, or that they have no purpose. But animals generally make sounds that their mates can hear. It’s more likely that the vocalization is yet another aspect of the natural world that, while outside the unaided human senses, has a quotidian function for the creatures using it. Sharks detect minute electrical fields to sense the world around them. Birds can see the ultraviolet light of each other’s iridescent wings, possibly to gauge potential mates. The sides of some fish have hair-like sensors they use to find food, sense predators, and find their way in the current. In fact, earlier this year, WSU researchers Allison Coffin and Jen McIntyre reported that polluted stormwater was hindering the development of the hairs in coho salmon. It’s not clear why a bird would want to sing so high. Mello hypothesizes that it helps it deal with the general din of the Atlantic Forest, a lush biome thick with creatures, including some 40 other species of hummingbirds.